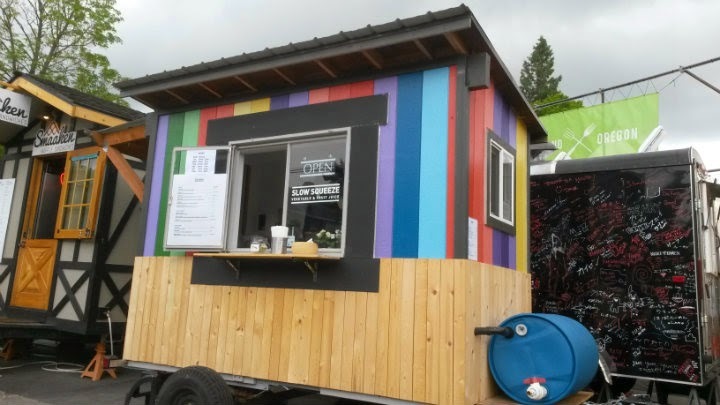 Slow Squeeze is a juice cart located at the Tidbit pod (SE 28th and Division) in Portland, Oregon. 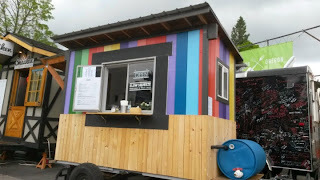 Talk about a brand new cart: Slow Squeeze opened on May 16 -- and I just happened to be one of their first customers. All juices contain fruit, and a good chunk of them contain some type of vegetable. Approximately 10-11 juices to choose from on the menu. A mix of green juices, yellow/orange juices, and purple/red juices. Many were interesting, even to me. Some juices contained fennel, others included broccoli. One juice even had cabbage as an ingredient. Two sizes here: 9 oz. and 12 oz. Seeking something refreshing for the morning, I got a 9 oz. cup of "Skin Glow" ($5.25): Grapefruit, orange, carrot, red grape, and lime. A lovely orange color. I detected the grapefruit and orange right away. The red grape pushed through as well. Overall, just a solid choice. The owners' favorites include "Inner Detox" (apple, orange, spinach, kale, parsley, cilantro, celery, and lemon) and "Berry Young" (pineapple, strawberry, raspberry, blueberry, blackberry, and goji berry). In the morning, the "Morning Energy" is an ideal pick (apple, carrot, orange, and ginger). For the future, I'd probably default to the 12 oz. on all drinks. Three additional ounces for a buck more.